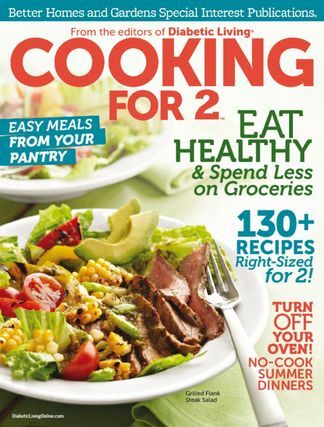 Cooking for 2 is a great resource for people who want to cook healthy meals for just one or two people. Get more than 125 nutritious and delicious recipes with right-size portions, full nutrition information, and diabetes-friendly ingredients. No extra groceries, no waste, no expensive ingredients. Includes a photo of every recipe and every recipe is tested and reviewed by registered dietitians in the Better Homes and Gardens Test Kitchen. Be the first person to tell us what you think about Cooking for 2 and you'll save $5 on your next purchase! https://www.isubscribe.co.nz/cooking-for-2-digital-subscription.cfm 15758 Cooking for 2 https://www.isubscribe.co.nz/images/covers/nz/541/15758/square/Cookingfor191610524.jpg NZD InStock /Digital/Food & Wine/Healthy Cooking for 2 is a great resource for people who want to cook healthy meals for just one or two people.